Recently our team conducted a session for 11-14 year olds and spent a section specifically addressing online bullying. Unfortunately this issue has become even more rampant since the wave of seemingly “consequentless anonymizers” like Snapchat have taken center stage. In today’s anonymous world youth are encouraged to dissociate themselves with negative behavior and instead cling to their anonymous label that grants them access to the “waves of culture”. Instead of strength of character we see a growing epidemic of mean behavior amongst those that should be brothers and sisters. 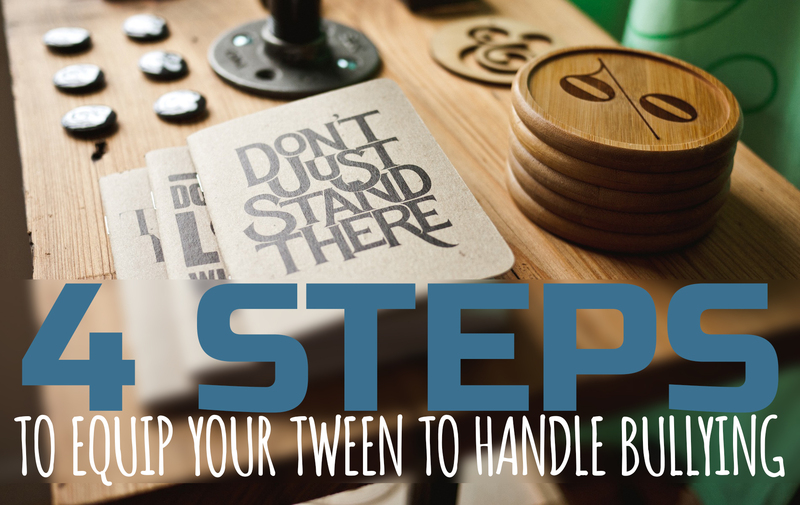 We’d like to share a few practical steps you can share with your tween to help them in bullying situations. Oftentimes adults are somewhat in the dark about how prevalent this issue is in their tween or teen’s world. Step one to combat this is to step in to their world. The easiest way into the world of tweens is by connecting with your child in familiar non-threatening conversations. These conversations can be started with simple questions like “Who is your favorite person at school?” or “Who is the most popular?” Make an effort as these conversations progress to take note of your child’s reactions and responses. Even jot down the names they mention on your phone. It will mean a lot to your child when you are able to follow up and ask how their peers are by name and not just description. Parents’ reactions to difficult situations will shape the way our kids relate their world to us. Kids often feel that they exist within two or more “worlds” and do their best to maintain a positive atmosphere in all of them. There is the school world, home world, and various game or online worlds that add to this. As a parent you need to be willing to step out into their other worlds. That may mean sitting in on a gaming session, asking for a tour of their Facebook or WhatsApp, or visiting them for lunch at school (if appropriate). Do whatever you need to in order to better understand where they live day to day. Try to always remember the old saying “hurt people hurt people”. It seems simple enough, but it is imperative to remember that the one hurting others is usually trying to cover their own wounds. By jumping into a situation too quickly you can re-victimize the participants and thus get yourself excommunicated from their world quite quickly. Remember to keep your cool in these situations and make a concentrated effort to examine the situation from an unbiased perspective. Lastly, be sure to involve leadership that knows both parties well in the conflict resolution stage. Once I saw a video on a nature channel about a mother bear and her cubs. I vividly remember the look in the mother’s eyes and body language when she realized the camera crew was stepping closer to her cubs. She had been grazing behind them comfortably, but seeing the possible danger she moved to step over her cubs and re-situate herself between them and the camera man. If you notice your child is the target of bullies, don’t be afraid to step between them and the bully to bring balance and protection to the situation. This definition by Albert Einstein of insanity could easily be applied in this arena as well. We cannot continue moving in the same direction and stay in the same patterns but expect things to change. Sit down with your spouse and then with your tween and figure out as a team what steps you all need to take regarding your specific situation. Step one should always be to our knees in prayer as we seek first the Kingdom. Courtney is Generation of Virtue’s lead solutions specialist. Which is a fancy way of saying she handles the team’s many IT needs and spends a lot of time in Photoshop. When she’s not finding solutions to problems, Courtney enjoys communicating God’s truth about love and relationships to teenagers and…drinking coffee. This entry was tagged behaviors, bullying, culture, Generations of Virtue, leadership, parenting, parents, prayer, pre-teens, social media, social roles, teens, tweens. Bookmark the permalink.